With the topic of government false flag operations being discussed throughout the country with the recent slow but progressive mass awakening to such events occurring in America it seems like good timing to marinate on the issue and discuss just how the average person can develop the skills required to skillfully predict and catch government false-flag attacks in real-time and awaken others around you to these events and the political motives behind them. I use the word ‘art’ because I believe being right about such high level events deserves attention for the cognitive and intellectual skills required and the ‘delivery of truth’ skills required to share these truths with receptive (intellectually honest) members of society. Truth is always vindicated and victory goes to the opponent that is willing to deal with ALL the facts openly and transparently, as truth seekers in the information war have done for very long in America. The establishment government on the other hand always plays the same hand with these events. Today these longstanding patterns of similarity that follow false flag operations have naturally rendered some clear patterns for those of us seeking truth to recognize. The art of catching government false flags in real time begins with altering your belief system to disconnect your mind from the influence the mainstream media has on it. This ‘connection’ is very real and understanding how important it is to disconnect your mind from mainstream media lies cannot be understated. Many Hollywood movies and almost all TV shows play a huge roll in reinforcing the government narrative, as does the public school curriculum, so you will also have to be aware of the connection between these as well, however, since the mainstream media breaking news story of the next false-flag attack is the very thing you’ll be judging, it is paramount to distance oneself from this entity. This is the most important step that will make catching your first real-time false flag very easy. Armed with a clear mind and now thinking on your own, considering all logic and reason you are now prepared to clearly see your first false flag event. Your mind is prepared to see what is right in front of you now that you have removed the signal that was blurring your understanding. A free person with a clear mind free of government engineered propaganda and marketing is a powerful tool with potential that is unlimited. The magic of living in a world where a controlled media and government does not even play a role in your life and your thinking process is a magic you cannot imagine until you cross that bridge. With that said let’s explore the next step. Are you aware of the stakes at hand? Consider history and what the end result of too much government control really means. Consider what freedom for humanity really means and those who have given their lives for these beliefs in the past. Apply the process of critical thinking to these ideas and see what you discover. First, approach the process of thinking with the purpose of being the best. Exercise what I call Intellectual Karate. Realize that you are about to go into an arena where the battle is for reason, truth, justice, logic, wisdom and cognitive conquering. Think for a minute, if mankind is truly the superior animal on the planet because of its cognitive abilities and its abilities to apply a form of higher brain intelligence that allows us to conquer all other animals; then shouldn’t we care which form of mankind-thinking (meaning which paradigm) will ultimately control the destiny of the species? This I believe is the core meaning of the information war we fight; a competitive battle of cognitive expressions of truth versus lies, each side representing a specific agenda, that being selfishness versus altruism or personal greed and thirst for power versus selfless concerned for the future experience of humans. I believe that this war is possibly spiritual and it (this battle of consciousness) defines who we are as a whole and will determine where humanity is headed. We owe it to ourselves to research history and see how governments have used false flag operations for political gain in the past. 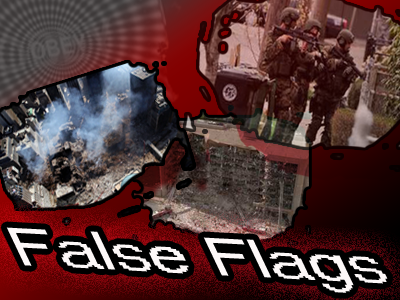 The fact of the matter is that false flag operations have been a commonly used tactic used by past governments to justify an attack on an enemy. See and understand the logic that makes planned attacks on a selected enemy nearly impossible without an engineered and carefully timed false flag attack. Become aware that false flag operations and tactics that incite the enemy are officially part of military strategy. Realize that documented U.S. government plans for false flags date back at least 50 years ago. Consider if government esteemed false flag tactics as an effective option 50 years ago then that is more than enough reason to suspect false flags to be a reasonable explanation for any potentially engineered bombing or attack. We can all see where false flags of the past have worked very well for the perpetrators. This information is difficult to hide. Throughout history the beneficiaries of false flag operations are undebatable. This is knowledge and power for truth seekers. Beneficiaries stand naked in the eyes of history, alone they stand hoping that humanity will look the other way, not notice or chalk up their improbable luck to coincidence. When government stands alone as the prime beneficiary of a false flag that should bother your sense of truth, trigger your intellectual integrity and set off your truth meter. Side with reason and common sense before you blindly believe that governments luckily accept the results of apparent false-flag events and conveniently and impulsively change legislation to increase their power and take away the power from the people. Government false flags almost always have a patsy designed to take the blame. This patsy seems to always have a connection/relationship/history of interaction with the U.S. government (military, FBI, CIA). This relationship with the government entities is always ignored or down-played by the controlled government mouthpiece mainstream media. They always act as though the relationship is not real or not relevant. Amazingly, the patsy’s history always leads back to government. The patsy always denies doing it or tells the world they are being set up. Patsy’s are always eventually murdered, silenced, tortured or all the above. We all know that dead men tell no tales and tortured people will tell your tale. This is why torture and murder is and always will be illegal even when committed by a temporary criminal government. Government agents and entities always stage a massive presence at the event or scene of the crime well in advance and always just prior to the event. It never fails, yet many in America chalk this up to coincidence which there is no such thing as, when it comes to politically motivated events. The mainstream media is key to understanding false flags. Look for huge overplayed ‘Breaking News’. This type of news is extremely sensational and is ongoing. Stories are repeated and told by various mouthpieces in almost exactly the same way. Early on, the controlled mainstream media finds itself in a battle for laying out the initial narrative. They (the media) find themselves making gross errors but government steps in and declares the changing narratives within the first few days even if the story is contradictory to what was being said the first day. During this early period it is common to hear large segments of truth coming especially from local media networks struggling to figure out what is happening but having to depend on the highest level (government controlled) sources. During the coverage of the event look for media to sensationalize the emotional trauma portion of the event in a manner that engages the public and invokes a mass emotional response. Nowadays they specifically target the emotions of the masses to open them up to accepting a soon to be delivered solution (Problem-Reaction-Solution) to the false flag attack. The media coverage of this specific event will supersede coverage of any other tragedy or event. No matter what else is happening, government does not allow other events to get in the way of their planned false flags. Too much has been invested to get the reaction and subsequent politically motivated solution to come. This is an important observation to make in identifying government false-flags. The controlled mainstream media will always ignored huge facts testimonies, and figures surrounding the event. Look for the ‘ignore reality and facts’ mode the media goes into when working with a false flag event. Questions are very vague and not too challenging to the official story. In this phase look for politicians, police chiefs, mayors and media running from the real questions. Note in some cases you’ll be able to observe other huge (9/11 size) coincidences but not all false flags will be as easy to diagnose as the September 11th global government terrorist attacks. Many will be smaller scale and the scene of the crime will be limited to one instead of three. Challenge yourself by telling yourself that you are willing to believe the government-mainstream Media version of the story. Tell yourself that as long as the media version of the story is provable you are willing to believe only their version of the story. Then set out to prove the government-media claims. Get focused and go to work. Pick up every claim and set out to actually prove their claims. You’ll quickly find out that media and government actually never submit or put out any proof for any of their claims. Stay focused and prove this to yourself. Notice how they run from truth reason and actual proof. You will hopefully finally distinguish between a claim and actual factual proof. Once you see this reality you’ll never go back. You are now ready to take on the establishment and become a ninja for truth. Finally, after the false flag is over and time begins to pass the government-media complex will settle on one story. Facts and figures detrimental to their version of the story are never raised again and those that question their version of the story are demonized and ridiculed. After this initial phase Hollywood picks up the baton and reinforces the government-media version of the story from this point on. Beware handle with care and proceed slowly. The experience of catching your first government false flag in real time can be very distressing yet very liberating at the same time. My first real-time false flag was the Bin Laden death hoax of May 1st 2011 and it felt very troubling yet very liberating. It was like a mental jolt, an awakening years after already being awakened. This topic deserves a lot of attention and in this article we’ve discussed a sequence of factors that come into play for identifying government false flags. Realizing the magnitude of what is at stake, the power of the mainstream media, the improbability of government and media claims and coincidences including governments connection to their patsy’s are all part of the government false flag blueprint. Will you allow this pattern of deception to work on you again? Or will you be prepared to call out the government on the next bombing false flag. Are you still connected to the mainstream media poison? Is all of this a challenge to your paradigm? These are the fundamental questions you have to resolve before you can stand tall and know that you’ve caught your first government false flag. Good luck and remember, the greatest mind altering drug is the truth.